I didn't love this story like others did. I did love this story as a testament to survival and human resilience. Kya Clark grew up in an abusive home with an alcoholic father who beat the mom and later the siblings. Eventually the mom and remaining siblings all ran away leaving a 7-yr old Kya alone with an alcoholic father. She managed to survive even after he dad, dodging CPS sent social workers and managed to live on her own at the marsh. She became friends with Tate and later with Chase, the murder victim. Both relationships have profound effects both positive and negative on her development and her life. But it was her relationship with Chase that landed her on trial for his murder. This story wasn't a love story but there was love, true love here. I saw this book as Kya's Journey without much guidance from a mother or father, but learning to navigate society by spying from the outskirts. Learning how to be a woman from watching others etc. That's what I enjoyed most about this book. 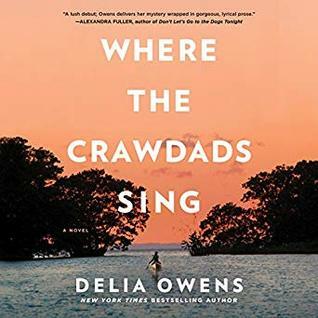 Sign into Goodreads to see if any of your friends have read Where the Crawdads Sing.